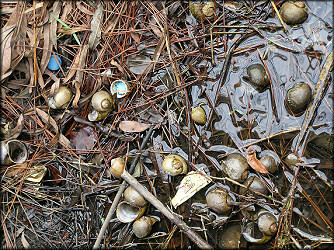 Acting on information provided by Dana Denson, Florida Department of Environmental Protection, on January 5, 2006 this reporter visited Treaty Park in western St. Johns County, where in August, 2005, the St. Johns River Management District had reported the presence of Channeled Applesnails. The location in question (GPS 29.49965N 081.21589W) is an un-named three acre lake within the confines of the 47 acre St. Johns County public park located at 1595 Wildwood Drive, south of State Road 207, about five miles southwest of St. Augustine. The lake complex also includes a somewhat narrow circular "canoe trail" which loops off the lake to the south/south southeast. 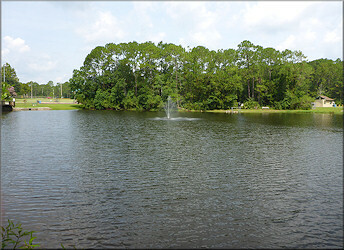 According to the St. Johns County Superintendent of Recreation, the park was constructed during 1991-92 during which time the lake was excavated. The park opened to the public during June of 1992. Within minutes of my arrival at the lake both live and dead Pomacea specimens as well as Pomacea egg clutches were found. Over the next two hours the entire shoreline of the lake and "canoe trail" were explored, and although numerous egg clutches were seen in both areas, only an additional five living specimens could be located. However, countless dead shells were found on the shoreline and the lake bottom - with the most shells found on the northeast corner of the lake [the apparent predominant downwind side). 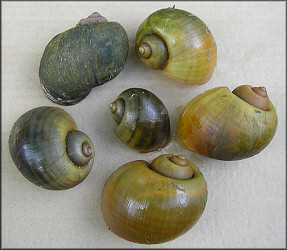 The lack of living specimens combined with the extremely large number of dead shells may indicate that the snail population is approaching or has exceeded the carrying capacity of the lake which appeared to have little aquatic vegetation. In fact one of the living specimens was found on the bank out of the water apparently foraging on available vegetation. 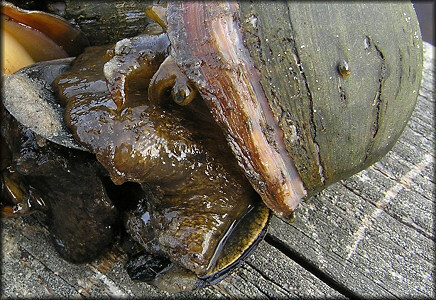 Additionally, a majority of the living specimens were severely eroded which likely indicates that the lake water is unusually acidic. A small very shallow ditch, which feeds into the lake via an approximately 75 yard long underground pipe from the northwest, was also investigated. Amazingly, the Pomacea had apparently made their way through the underground conduit from the lake and had colonized this very marginal habitat for a distance of several hundred yards. Both dead shells and recent egg clutches were in evidence the full length of the ditch. A follow-up investigation of this area was conducted on January 9th and 11th and on both occasions live Pomacea were found in the muddy substrate. To wrap up the day's activity, a very small along Wildwood Drive just outside the park entrance was investigated. Surprisingly three Pomacea juveniles (ca. 25 mm. ), including a live specimen, were found providing evidence that the species is not confined within the park's borders. During two subsequent visits (cited above) it was determined that the Pomacea had gained access to the small ditch via an underground culvert which drained water from the lake during high water periods. 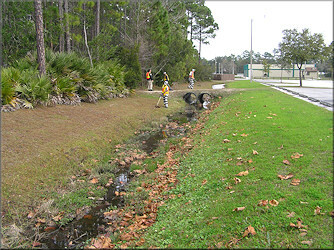 This roadside ditch flowed northward along Wildwood Drive for a distance of about 700 yards before crossing under the road near 1784 Wildwood Drive and presumably ultimately empting into nearby Moultrie Creek when water levels were sufficiently high. Numerous dead shells were found throughout the entire length of the ditch including that portion on the opposite side of the road. One freshly dead specimen was also found in the ditch some 300 yards north of the park. Because of the terrain, further exploration of the ditch was not possible as it flowed easterly towards Moultrie Creek. A follow-up visit was made to the Treaty Park area on September 25, 2006. During this visit the very difficult to access Moultrie Creek was investigated where it is spanned by a wooden bridge on Old Plantation Drive (GPS: 29.49671N 081.20947W). From the vantage point of the bridge a single empty Channeled Applesnail shell was spotted on the creek bottom some 20 feet below and subsequently retrieved - thus providing the first evidence that the snails may have spread from the park to the creek (empty shell from Moultrie Creek). Years later during a field survey on 8/3/2010, a series of aged empty Channeled Applesnail shells were found in Moultrie Creek near the intersection of Wildwood Drive and State Road 207 - a considerable distance north of both Treaty Park and Old Plantion Drive to the south (some of the empty shells from Moultrie Creek). No live specimens could be found at either the State Road 207 or at Old Plantation Drive locations.